Kenpo Karate is a rather unique style of self defense due to the fact that there are so many incredible self defense techniques in which a student can choose from. In Kenpo Karate we specialize in self defense techniques. I know of no other system in the world that has more self defense techniques than the Kenpo systems! 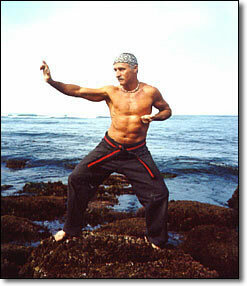 We in Kenpo like to think of ourselves as the "masters of motion." We teach our students the art of self defense through the science of body mechanics. Every time that you move your hand, turn your head, pivot your foot, or move a finger or toe there is a reason for it. I have heard people say that they could never learn to fight, and that it is just not in them. This is incorrect thinking. The truth of the matter is that if you can think - you can learn to fight and/or defend yourself. Many altercations end up in close quarters with pushing, shoving, and even grappling. The Kenpo self defense techniques allow the practicioner to feel comfortable fighting in such close range. As a matter of fact the closer an attacker is the more comfortable the Kenpo stylist should feel. With Kenpo self defense techniques you could defend yourself in a telephone booth. Kenpo is truly a street fighting art with lots of gouging, ripping and tearing at your opponent and crushing of bone, tendons, and joints. A trained Kenpo stylist should have the confidence to handle about any situation that he may come across. "When a strong man armed keepeth his palace, his goods are in peace."